The Trans-Pacific Partnership's effects on drug prices and patents alarmed some physician-advocates. 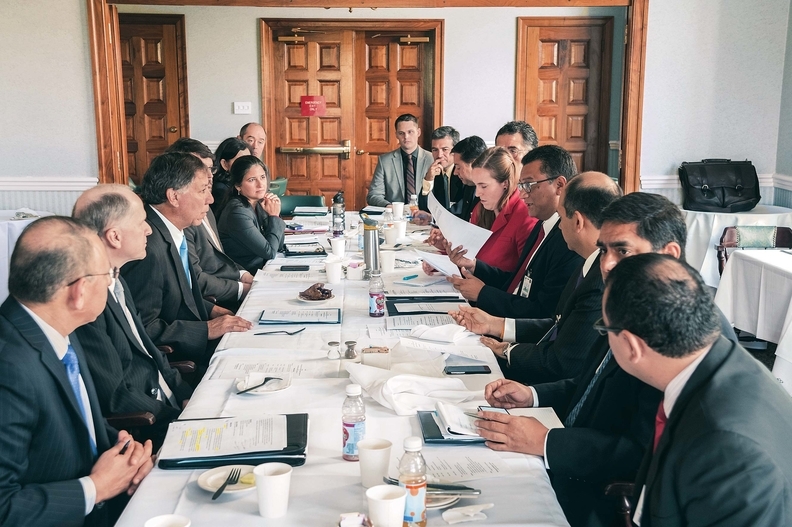 Above, representatives from the U.S. and Peru met in Washington in April 2015 to discuss trade issues related to the pact. President Donald Trump has signed an order withdrawing the U.S. from the Trans-Pacific Partnership that has been contested by both healthcare companies and activists. President Barack Obama had ended negotiations on the deal, which extends greater protection for pharmaceutical patents across a dozen Pacific Rim countries. Obama, however, failed to garner enough support in Congress to ratify its passage into law. Trump had pledged during his campaign to remove the U.S. from the partnership, which he called a “horrible deal.” It was also criticized by the Democratic presidential candidate Hillary Clinton. The deal was never about “free trade,” but rather about protecting the interests of brand-name pharmaceutical companies, said Peter Maybarduk, director of Public Citizen's Access to Medicines Program. Moving forward, the Trump administration should encourage competition in the sector, he said. It would have eliminated 18,000 taxes that other countries place on goods from the U.S. The nations that have signed the TPP are the U.S., Australia, Brunei, Canada, Chile, Japan, Malaysia, Mexico, New Zealand, Peru, Singapore and Vietnam. But the agreement had few steadfast fans, as activists feared its intellectual property protections would increase global pharmaceutical prices, while the industry felt those protections didn't go far enough. Both consumer group Public Citizen and aid organization Doctors Without Borders decried the deal's intellectual property provisions that required participating countries to extend data protection for biologic medicines—drugs produced with living matter—for at least five to eight years. They argued that doing so would keep biosimilars—the reproduced “generic” versions of biologics—from entering the market and bringing prices down. Pharmaceutical Research and Manufacturers of America, which represents the U.S. drug industry, was concerned that the intellectual property protections weren't strong enough. Drugmakers supported 12 years of data exclusivity to match the period required under U.S. federal law. Some of the countries in the deal don't have any exclusivity laws for biologics. The Advanced Medical Technology Association, known as AdvaMed, has been supportive of the deal, saying early last year that the deal would combat “corrupt business practices” and establish global “codes of conduct” for device trade. AdvaMed did acknowledge, however, that certain issues and concerns raised by other business sectors and Congress needed to be solved. AdvaMed offered a short, forward-looking statement on Monday following Trump's order. “The medical technology industry has consistently supported trade agreements that open markets and improve patient access to needed medical advancements. We look forward to working with the new administration as it pursues these pro-innovation, pro-patient goals,” said Ralph Ives, AdvaMed's executive vice president of global strategy and analysis. The Generic Pharmaceutical Association said in a statement Tuesday that policymakers should develop patent rules that balances incentives for innovation with a desire for generic competition.. GPhA also called on the Trump administration and Congress to stop brand drug companies from interfering in generic drug development and access. Judit Rius Sanjuan, the U.S. manager for Doctors Without Borders' Access Campaign, said her organization believes it's possible to enact a future trade agreement that satisfies both the private sector and NGOs that are concerned about drugmaker monopolies. “We would like to see an agreement that is a win-win for innovation and access,” she said. But Sanjuan said it's too early to know what the Trump administration's next steps will be, and it's hard to tell how the White House will treat the interests of pharmaceutical companies and NGOs. While the Republican party tends to be pro-industry, Trump chastised the pharmaceutical industry's pricing practices at many points throughout his campaign. He has also said that he supports importing drugs from other countries and allowing Medicare to directly negotiate on drug prices, which are both measures that are opposed by PhRMA. Early in his campaign, Trump called the TPP a “horrible deal … designed for China to come in, as they always do, through the back door and totally take advantage of everyone.” China isn't involved in the partnership; in fact, it's possible that China could swoop in with its own deal to entice Pacific Rim countries. Sen. John McCain (R-Ariz.), chairman of the Senate Armed Services Committee and a former presidential candidate, said in a statement that withdrawing from the TPP was a “serious mistake” that would have lasting consequences for the U.S. economy and its position in the Asia-Pacific region.